Please refer to our stock # TCR6869 when inquiring. 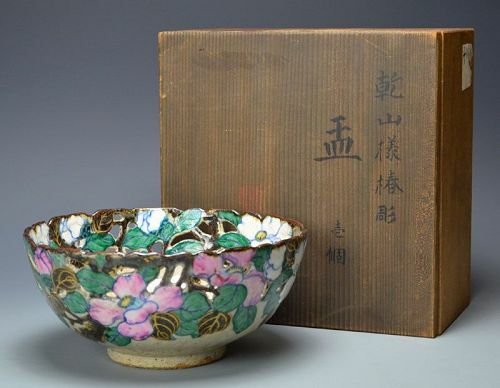 Pierce-work combined with over and under glaze decoration create the perfect picture of spring on this bowl by Takahashi Dohachi enclosed in the original wooden box signed Kachutei Dohachi and titled Kenzan Yo Tsubaki Bori Hachi (Kenzan style Camelia patterned Carved Bowl). It is 20 cm (8 inches) diameter and in excellent condition. The Dohachi Kiln was established in Awataguchi by the retainer of Kameyama fief, Dohachi I around 1760, and the name Dohachi was brought to the forefront of porcelain by the second generation head of the family who attained an imperial following, and grew to be one of the most famous potters of the Later Edo period to come from Kyoto. He moved the kiln to the Gojo-zaka area (at the foot of Kiyomizu temple) in 1814 And was well known for research into and perfection of ancient Chinese and Korean forms long held in high esteem in Japan, and at the same time worked to expand the family reputation within tea circles. The fifth generation took head of the family in 1897 and was one of the top rated potters of his time, heavily influencing following generation including one of his top students, Ito Tozan. The importance of the Dohachi workshop may be determined by the pair of vases held by the V&A (London) purchased in the 1870s under the orders: that they should 'make an historical collection of porcelain and pottery from the earliest period until the present time, to be formed in such a way as to give fully the history of the art.